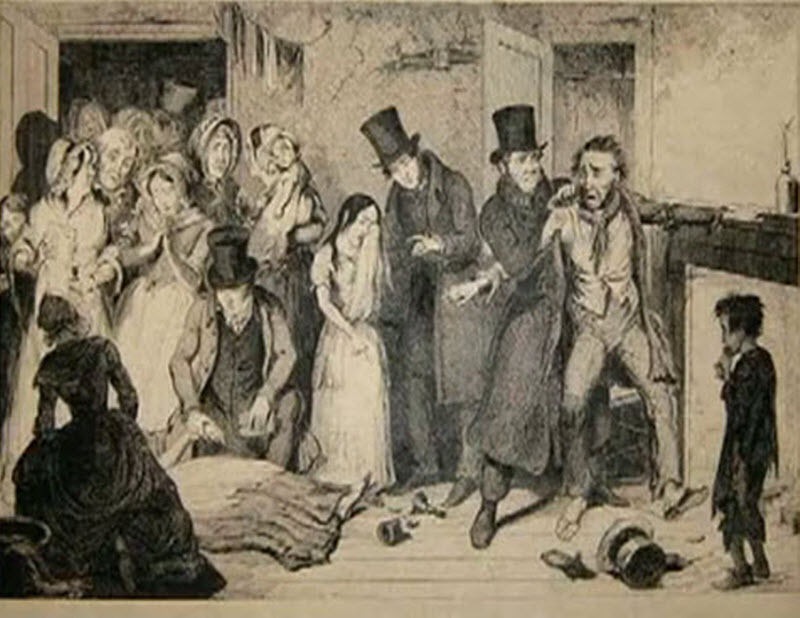 In his earlier life, George Cruikshank had been a very heavy drinker but he could not ignore the effects of alcohol on his own family: his father and brother both were alcoholics; his father died of alcohol intoxication after winning a drinking context. 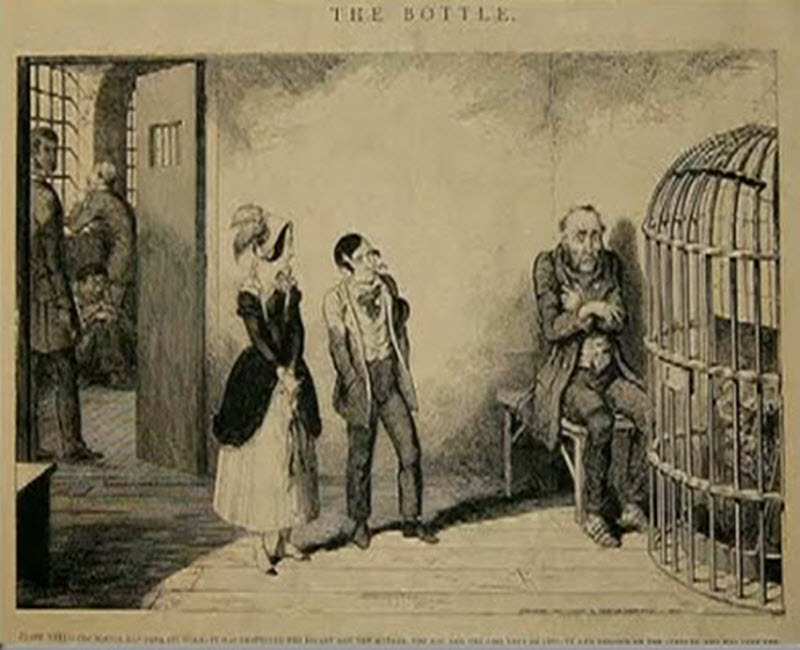 As a result Cruikshank turned against alcohol and, in his later years, became a teetotaler and began preaching against the evil of alcohols. He lent his considerable artistic talents to focusing public attention on the evils created by alcohol abuse such as broken families, domestic violence and indolence. Some things never change. 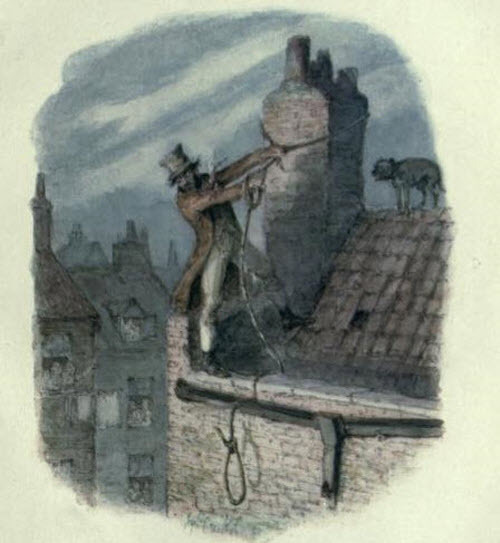 Cruikshank's ultimate aim was complete Prohibition. 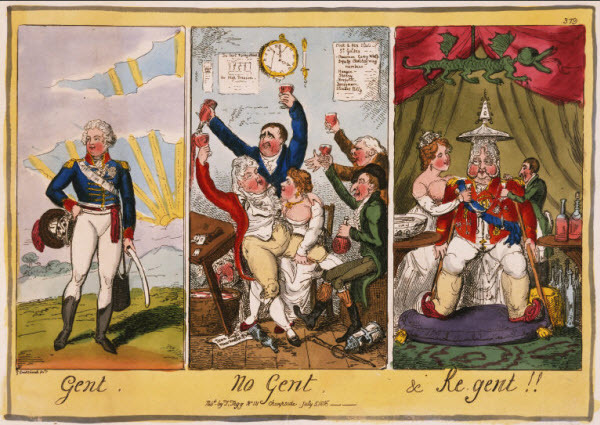 He allied himself with the Temperance League, and organization dedicated to banning the sale and consumption of all alcohol in England. 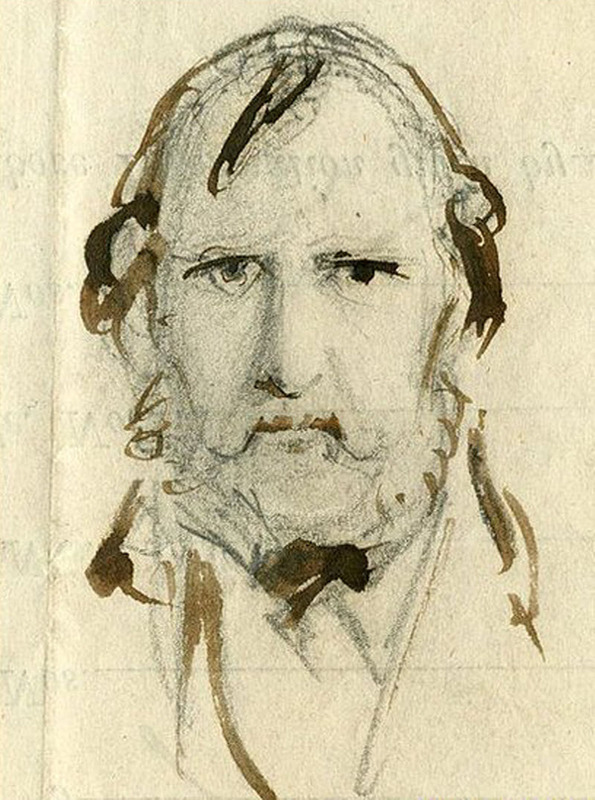 In 1856, Cruikshank was recognized for his efforts by being appointed president of the Temperance League. 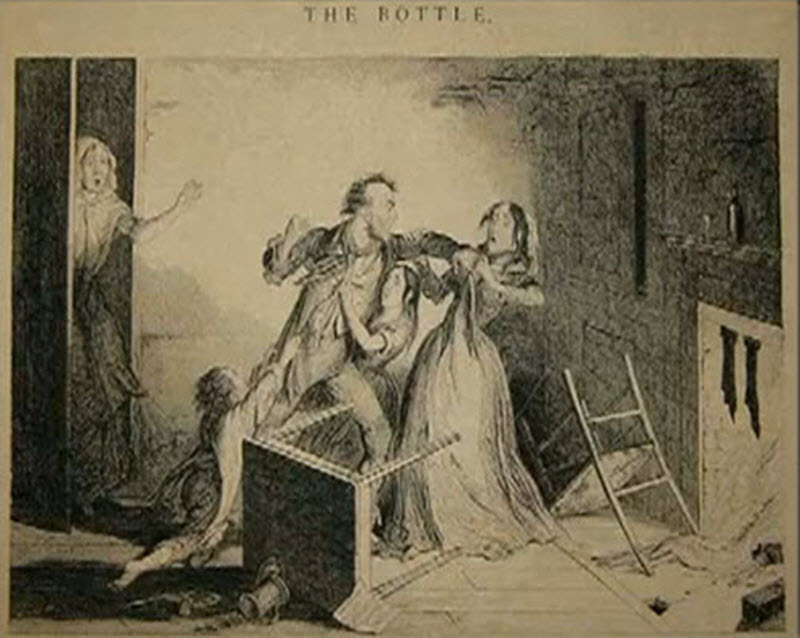 His main contribution to the movement were a series of illustrations to various anti-alcohol propaganda, including a series of 8 drawings for a fairly pedantic play called The Bottle, in which a drunken husband beats his wife, terrorizes his children, and loses everything before hitting rock bottom and rejecting the demon which is alcohol. 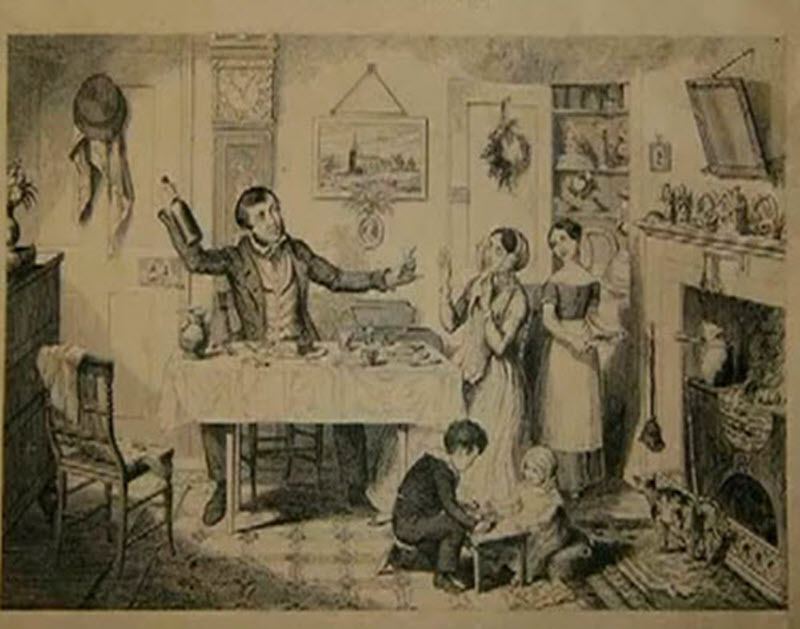 The first illustration shows a man with a young family, and what looks to be a comfortable home. He has a wife, and young children, including one who is still a baby. The man is drinking at the kitchen table, waving the evil bottle of alcohol in the air. His wife is pleading him to stop but he ignores her nagging. Soon the effects of the man's drinking can be felt. 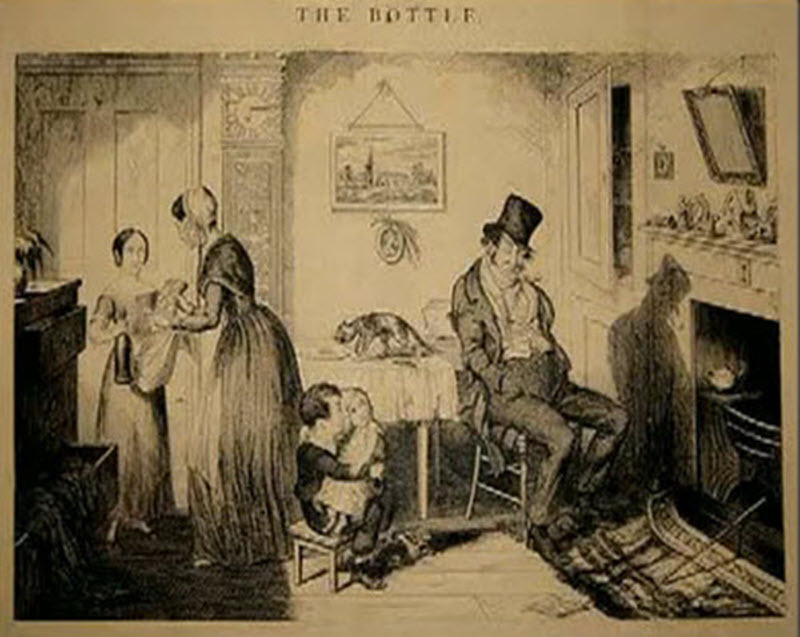 The man sits by the fire drinking and ignores his family. The man's drinking leads to financial ruin. 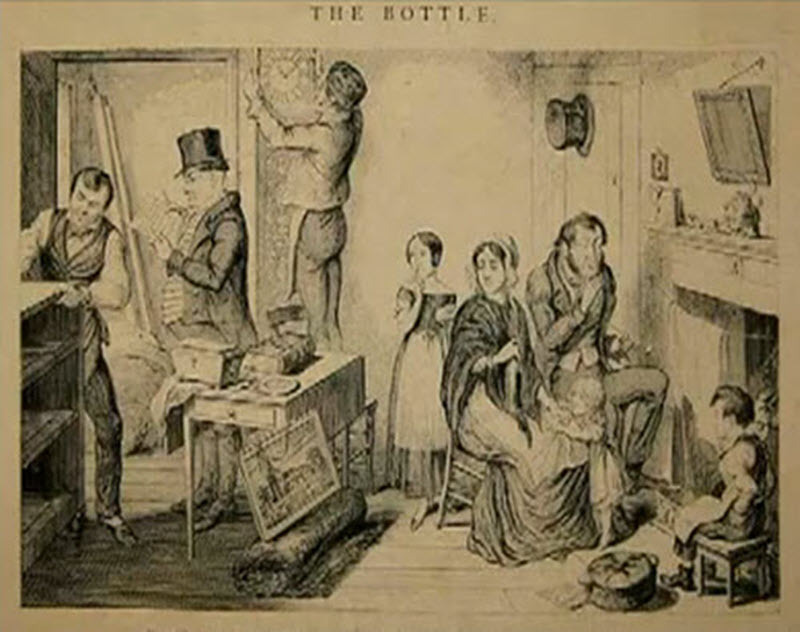 The family is seen cowering in the corner while creditors take away all of their possessions. 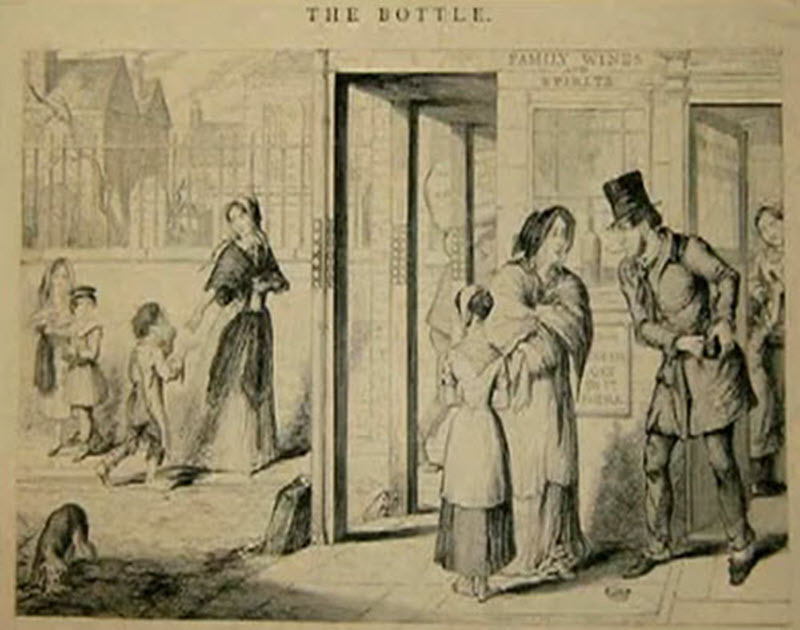 As a result of the man's love affair with the bottle, his wife and young daughter are forced to beg on the street - or perhaps even worse. The husband and the wife argue constantly over the husband's income and they come to blows. 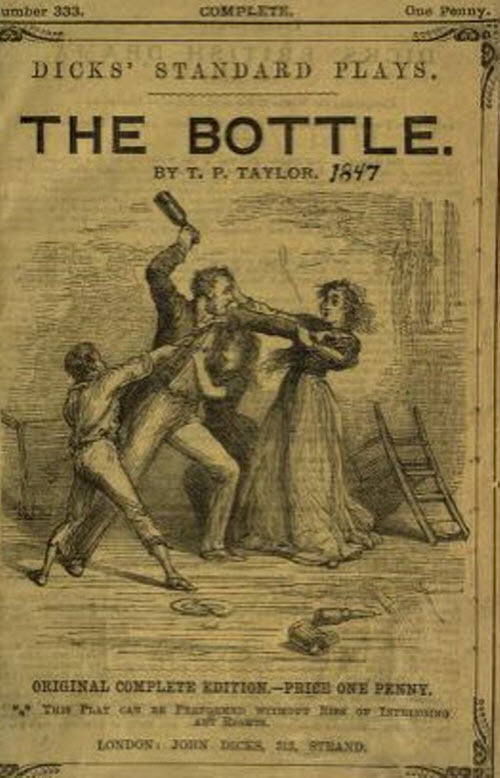 The drunkard strikes his wife in front of his terrified children, who try to stop him. 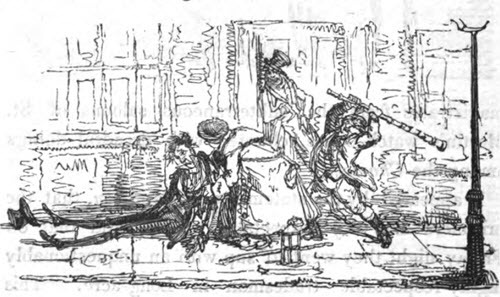 The commotion draws crowds of neighbours who enter the apartment to find the poor wife on the floor where she has been felled by her drunken brute of a husband. It's game over for the husband. The bottle has ruined his life. We seem him in jail visited by his children. 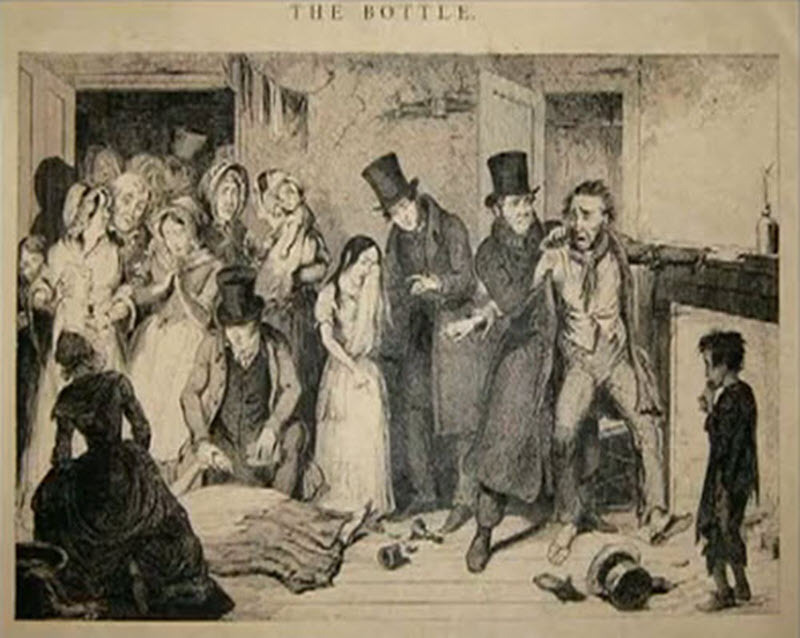 This is the fate that awaits inside every bottle of gin and cheap whiskey.